The upstream oil and gas industry uses glycol dehydrators to remove water from natural gas. The dehydration process also helps to prevent corrosion and hydrate formation in pipelines. A 2004 industry survey identified about 3,900 glycol dehydrators in service in Canada. The majority of the units are installed in rural environments, and typically unmanned/unattended. A study by the Natural Gas Star Program (EPA) reports approximately 36,000 glycol dehydration systems in the US natural gas production sector. In the past years, glycol dehydration plants have been successfully designed using “off-the-shelf” process simulators such as Aspen HYSYS, ProMax and other similar tools. While still sufficient for many applications, today improved models are often required to predict the fate of trace elements. In many cases the plant feed will contain small quantities of aromatic hydrocarbons that are quite soluble in the TEG. The aromatics are primarily comprised of benzene, toluene, ethylbenzene, and xylenes (BTEX). These aromatics are carried to the flash tank where a small fraction is released along with other volatile organic compounds (VOC’s). The remaining VOC’s and aromatics travel to the regenerator where the application of heat will remove virtually all volatile gases. Since the regenerator is usually vented to the atmosphere, there may be serious environmental impacts, even in small plants, where the total benzene emissions can easily exceed 1-5 tonnes/year. Government regulators worldwide have been issuing ever more stringent regulations on the emissions of these toxic compounds to air. 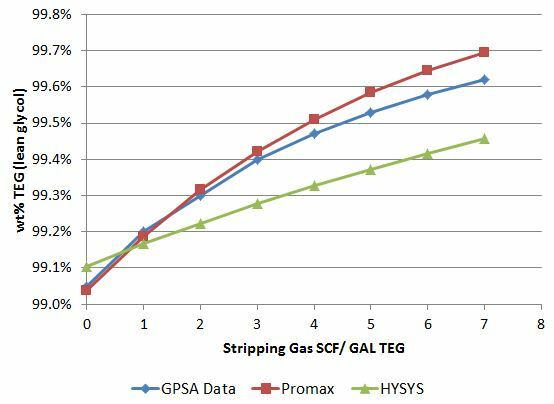 HYSYS-Peng Robinson, HYSYS-Glycol and GLYCalc all had a reasonable match to the BTEX liquid-phase concentration data from GPA RR-131 at contactor and flash tank conditions. HYSYS-Peng Robinson and HYSYS-Glycol had reasonable matches to BTEX concentration data at regenerator conditions. Given the empirical nature of the relationship used to model the regenerator in GLYCalc, it is difficult to make the comparison; however, we conclude that GLYCalc consistently overpredicts BTEX K-values in the regenerator. HYSYS predicted dry gas water content more accurately than GLYCalc. It is not uncommon for GLYCalc and HYSYS to give vastly different predictions; we conclude that GLYCalc frequently predicts dry gas water contents 50% lower than expected values. HYSYS-Glycol gave the best predictions here (Figure 1). It is further noted that property packages can be modified (most notably by modifying interaction parameters to better represent available experimental and plant data) and selectively applied in HYSYS providing an opportunity to improve on the available methods. Glycol concentrations up to 99.6 % w/w can be achieved by sparging stripping gas directly into the reboiler (higher concentrations can be achieved with a stripping column). Stripping gas is typically dry fuel gas. The use and rates of stripping gas should be adequately evaluated because it is typically emitted into the atmosphere from the still vent and will therefore significantly affect greenhouse gas emissions due to the high methane concentration of the stripping gas. Charts are available in standard references such as the GPSA data book and other vendor publications, and may be consulted for estimating the stripping gas requirements for specified sets of conditions. Reductions in stripping gas consumption can translate directly into savings both in operating cost as well as increased fuel gas recovery. It is therefore essential for the optimal operation of the unit to determine whether stripping gas is actually required to achieve the desired dew point suppression. Dehydration plants that handle relatively warm inlet gas will tend to require stripping gas to meet sales gas specifications, however in practice it has been observed that a large number of units operate with stripping gas when it is not needed, leading to increased fuel gas use and emissions. The simulators can also be used to predict the inlet gas temperature at which stripping gas would be required, for a given dry gas water content. It is noted that the elimination of stripping gas may bring additional operational benefits for units where still vent condensers are in use to control BTEX emissions; the elimination of stripping gas would increase the condenser performance dramatically.